This article is about the 19th century state. For the Nigerian traditional state, see Sokoto Sultanate Council. The Sokoto Caliphate was an independent Islamic Sunni Caliphate, in West Africa. Founded during the jihad of the Fulani War in 1804 by Usman dan Fodio, it was abolished when the British defeated the caliphate in 1903 and put the area under the Northern Nigeria Protectorate. Developed in the context of multiple, independent Hausa kingdoms, at its height the Caliphate linked over 30 different emirates and over 10 million people in the most powerful state in its region and one of the most significant empires in Africa in the nineteenth century. The caliphate was a loose confederation of emirates that recognized the suzerainty of the "commander of the faithful", the sultan or caliph. The caliphate brought decades of economic growth throughout the region. An estimated one to 2.5 million non-Muslim slaves were captured during the Fulani War. Slaves provided labor for plantations and were provided an opportunity to become Muslims. Although the British abolished the political authority of the Caliphate the title of Sultan was retained, and remains an important religious position for Muslims in the region to the current day. Usman dan Fodio's jihad provided the inspiration for a series of related jihads in other parts of the savanna and Sahel far beyond Nigeria's borders that led to the foundation of Islamic states in Senegal, Mali, Ivory Coast, Chad, Central African Republic, and Sudan. The major power in the region in the 17th and 18th centuries had been the Bornu Empire. However, revolutions and the rise of new powers decreased the power of the Bornu empire and by 1759, its rulers had lost control over the oasis town of Bilma and access to the Trans-Saharan trade. Vassal cities of the empire gradually became autonomous, and the result by 1780 was a political array of different, independent states in the region. The Fall of the Songhai Empire in 1598 had also freed much of the central Bilad as-Sudan, and a number of Hausa Sultanates led by different Hausa aristocracies had grown to fill the void. Three of the most significant to develop were the Sultanates of Gobir, Kebbi (both in the Rima River valley), and Zamfara, all in present-day Nigeria. These kingdoms engaged in regular warfare against each other, especially conducting slave raids, and in order to pay for the constant warfare levied high taxation on their citizens. 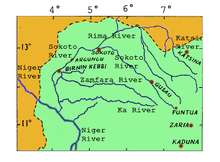 The region between the Niger River and Lake Chad was largely populated with the Hausa, the Fulani, and other ethnic groups that had immigrated to the area. Much of the Hausa population had settled in the cities throughout the region. The Fulani, in contrast, had largely remained a pastoral community, herding cattle, goats and sheep, and populating grasslands between the towns throughout the region. With increasing trade, a good number of Fulani settled in towns, forming a distinct minority. Much of the population had converted to Islam in the centuries before; however, nationalist and pagan beliefs persisted in many areas. In the end of the 1700s, an increase in Islamic preaching occurred throughout the Hausa Kingdoms. A number of the preachers were linked in a shared Tariqa of Islamic study. Usman dan Fodio, an Islamic scholar and an urbanized Fulani, had been actively educating and preaching in the city of Gobir with the approval and support of the Hausa leadership of the city. However, when Yunfa, a former student of dan Fodio, became the Sultan of Gobir he restricted dan Fodio's activities, forcing him into exile in Gudu. A large number of peoples left Gobir to join dan Fodio, who also began to gather new supporters from other regions. Feeling threatened by his former teacher, Yunfa declared war on dan Fodio on February 21, 1804. Dan Fodio was elected "Commander of the Faithful" (Amir al-Mu'minin) by his followers, marking the caliphate's start. Usman dan Fodio then declared a number of flag bearers amongst those following him, creating an early political structure of the empire. Declaring a jihad against the Hausa kings, dan Fodio rallied his "warrior-scholars" against Gobir. Despite some early losses at the Battle of Tsuntua and elsewhere, the forces of dan Fodio began taking over some of the key cities starting in 1805. The jihadis used guerilla warfare to turn the conflict in their favor, and gathered support from the civilian population, which had come to resent the "despotic" rule and high taxes of the Hausa kings. Even some non-Muslim Fulani started to support dan Fodio. The war lasted from 1804 until 1808, and resulted in thousands of deaths. The forces of dan Fodio were able to capture the states of Katsina and Daura, the important kingdom of Kano in 1807, and finally conquered Gobir in 1809. In the same year, Muhammed Bello, the son of dan Fodio, founded the city of Sokoto, which became the capital of the Sokoto Caliphate. The jihads had created "a new slaving frontier on the basis of rejuvenated Islam." By 1900 the Sokoto caliphate had "at least 1 million and perhaps as many as 2.5 million slaves", second only to the American South (which had four million in 1860) in size among all modern slave societies. However, there was far less of a distinction between slaves and their masters in the Caliphate. From 1808 until the mid-1830s, the Sokoto Caliphate expanded, gradually annexing the plains to the west and key parts of Yorubaland. It became one of the largest states in Africa, stretching from modern-day Burkina Faso to Cameroon and including most of Northern Nigeria and Niger Republic. At its height, the Sokoto Caliphate included over 30 different emirates under its political structure. The political structure of the Caliphate was organized with the Sultan of Sokoto ruling from the city of Sokoto (and for a brief period under Muhammad Bello from Wurno). The leader of each emirate was appointed by the Sultan as the flag bearer for that city but was given wide independence and autonomy. Much of the growth of the Caliphate occurred through the establishment of an extensive system of ribats as part of the consolidation policy of Muhammed Bello, the second Sultan. Ribats were established founding a number of new cities with walled fortresses, schools, markets, and other buildings. These proved crucial in expanding the Caliphate by developing new cities, settling the pastoral Fulani people, and supporting the growth of plantations which were crucial to the economy. By 1837, the Sokoto Caliphate had a population around 10 million people. The Sokoto Caliphate was largely organized around a number of largely independent emirates pledging allegiance to the Sultan of Sokoto. The administration was initially built to follow those of Muhammad during his time in Medina but also the theories of Al-Mawardi in "The Ordinances of Government". The Hausa kingdoms prior to the caliphate had been run largely through hereditary succession for leadership. The early rulers of the Sokoto Caliphate, dan Fodio and Bello, abolished systems of hereditary succession and preferred if leaders were appointed by virtue of their Islamic scholarship and moral standing. Emirs were appointed by the Sultan; they traveled yearly to deliver allegiance and taxes, in the form of crops, cowry shells, and slaves. When a Sultan died or retired from the office, an appointment council made up of the Emirs would select a replacement. Direct lines of succession were largely not followed for Sultan, although each Sultan claims direct descent from dan Fodio. The major administrative division was between the Sokoto Caliphate and the Gwandu Emirate. In 1815, Usman dan Fodio retired from the administrative business of the Caliphate and divided the area taken over during the Fulani War with his brother Abdullahi dan Fodio ruling in the west with the Gwandu Emirate and his son Muhammed Bello taking over administration of the Sokoto Caliphate. The Emir at Gwandu retained allegiance to the Sokoto Caliphate and spiritual guidance from the Sultan, but the Emir managed the separate emirates under his supervision independently from the Sultan. The administrative structure of loose allegiances of the emirates to the Sultan did not always function smoothly. There was a series of revolutions by Hausa aristocracy in 1816–1817 during the reign of Muhammed Bello, but the Sultan ended these by granting those members title to land. There were multiple crises that arose during the century between the Sokoto Caliphate and many of the emirates: notably, the Adamawa Emirate and the Kano Emirate. A serious revolt occurred in 1836 in the city-state of Gobir, which was crushed by Muhammed Bello at the Battle of Gawakuke. The Sufi community throughout the region proved crucial in the administration of the caliphate. The Tariqa brotherhoods, notably the Qadiriyya to which every successive Sultan of Sokoto was an adherent, provided a group linking the distinct emirates to the authority of the Sultan. Scholars Burnham and Last claim that this Islamic scholarship community provided an "embryonic bureaucracy" which linked the cities throughout the Caliphate. After the establishment of the Caliphate, there were decades of economic growth throughout the region, particularly after a wave of revolts in 1816–1817. They had significant trade over the trans-Saharan routes. After the Fulani War, all land in the empire was declared waqf or owned by the entire community. However, the Sultan allocated land to individuals or families, as could an emir. Such land could be inherited by family members but could not be sold. Exchange was based largely on slaves, cowries or gold. Major crops produced included cotton, indigo, kola and shea nuts, grain, rice, tobacco, and onion. Slavery remained a large part of the economy, although its operation had changed with the end of the Atlantic slave trade. Slaves were gained through raiding and via markets as had operated earlier in West Africa. The founder of the Caliphate allowed slavery only for non-Muslims; slavery was viewed as a process to bring such peoples into the Muslim community. Around half of the Caliphate's population was enslaved in the 19th century. The expansion of agricultural plantations under the Caliphate was dependent on slave labor however. These plantations were established around the ribats, and large areas of agricultural production took place around the cities of the empire. The institution of slavery was mediated by the lack of a racial barrier among the peoples, and by a complex and varying set of relations between owners and slaves, which included the right to accumulate property by working on their own plots, manumission, and the potential for slaves to convert and become members of the Islamic community. There are historical records of slaves reaching high levels of government and administration in the Sokoto Caliphate. Its commercial prosperity was also based on Islamist traditions, market integration, internal peace and an extensive export-trade network. Islamic scholarship was a crucial aspect of the Caliphate from its founding. Sultan Usman dan Fodio, Sultan Muhammed Bello, Emir Abdullahi dan Fodio, Sultan Abu Bakr Atiku, and Nana Asma'u devoted significant time to chronicling histories, writing poetry, and Islamic studies. A number of manuscripts are available and they provide crucial historical information and important spiritual texts. This role did diminish after the reign of Bello and Atiku. European attention had been focusing on the region for colonial expansion for much of the last part of the 19th century. The French in particular had sent multiple exploratory missions to the area to assess colonial opportunities after 1870. French explorer Parfait-Louis Monteil visited Sokoto in 1891 and noted that the Caliphate was at war with the Emir of Argungu, defeating Argungu the next year. Monteil claimed that Fulani power was tottering because of the war and the accession of the unpopular Caliph Abderrahman dan Abi Bakar. However, following the Berlin Conference, the British had expanded into Southern Nigeria, and by 1902 had begun plans to move into the Sokoto Caliphate. British General Frederick Lugard used rivalries between many of the emirs in the south and the central Sokoto administration to prevent any defense as he worked toward the capital. As the British approached the city of Sokoto, the new Sultan Muhammadu Attahiru I organized a quick defense of the city and fought the advancing British-led forces. The British force quickly won, sending Attahiru I and thousands of followers on a Mahdist hijra. On March 13, 1903 at the grand market square of Sokoto, the last Vizier of the Caliphate officially conceded to British Rule. The British appointed Muhammadu Attahiru II as the new Caliph. Fredrick Lugard abolished the Caliphate, but retained the title Sultan as a symbolic position in the newly organized Northern Nigeria Protectorate. This remnant became known as "Sokoto Sultanate Council". In June 1903, the British defeated the remaining forces of Attahiru I and killed him; by 1906 resistance to British rule had ended. Although it has lost its former political power, the Sokoto Sultanate Council continues to exist and the Sokoto Sultans are still "leading figures in Nigerian society". Even the Presidents of Nigeria have sought their support. Due to its impact, the Sokoto Caliphate is also revered by Islamists in modern Nigeria. For example, the Jihadist militant group Ansaru has vowed to revive the Sokoto Caliphate in order to restore the "lost dignity of Muslims in black Africa". ^ McKay, Hill, Buckler, Ebrey, Beck, Crowston, Weisner-Hanks. A History of World Societies. 8th edition. Volume C - From 1775 to the Present. 2009 by Bedford/St. Martin's. ISBN 978-0-312-68298-9. "The most important of these revivalist states, the enormous Sokoto caliphate, illustrates the general pattern. It was founded by Usuman dan Fodio (1754-1817), an inspiring Muslim teacher who first won zealous followers among both the Fulani herders and Hausa peasants in the Muslim state of Gobir in the northern Sudan." p. 736. ^ a b Metz, Helen Chapin, ed. (1991). "Usman dan Fodio and the Sokoto Caliphate". Nigeria: A Country Study. Washington: GPO for the Library of Congress. Retrieved 2 September 2015. ^ a b c McKay, John P.; Hill,, Bennett D. (2011). A History of World Societies, Volume 2: Since 1450, Volume 2. Macmillan. p. 755. ^ a b c d e f g h i j Lovejoy, Paul E. (1978). "Plantations in the Economy of the Sokoto Caliphate". The Journal of African History. 19 (3): 341–368. doi:10.1017/s0021853700016200. ^ a b c d e f Falola, Toyin (2009). Historical Dictionary of Nigeria. Lanham, Md: Scarecrow Press. ^ a b c d e f g h i j Maishanu, Hamza Muhammad; Isa Muhammad Maishanu (1999). "The Jihad and the Formation of the Sokoto Caliphate". Islamic Studies. 38 (1): 119–131. ^ a b c Swindell, Kenneth (1986). "Population and Agriculture in the Sokoto-Rima Basin of North-West Nigeria: A Study of Political Intervention, Adaptation and Change, 1800–1980". Cahiers d'Études Africaines. 26: 75–111. doi:10.3406/cea.1986.2167. ^ a b c d e Chafe, Kabiru Sulaiman (1994). "Challenges to the Hegemony of the Sokoto Caliphate: A Preliminary Examination". Paideuma. 40: 99–109. ^ a b c d e f g h Comolli (2015), p. 15. ^ a b Stilwell, Sean (2000). "Power, Honour and Shame: The Ideology of Royal Slavery in the Sokoto Caliphate". Africa: Journal of the International African Institute. 70 (3). doi:10.3366/afr.2000.70.3.394. ^ a b c d e Burnham, Peter; Murray Last (1994). "From Pastoralist to Politician: The Problem of a Fulbe "Aristocracy"". Cahiers d'Études Africaines. 34: 313–357. doi:10.3406/cea.1994.2055. ^ Salau, Mohammed Bashir (2006). "Ribats and the Development of Plantations in the Sokoto Caliphate: A Case Study of Fanisau". African Economic History. 34: 23–43. doi:10.2307/25427025. ^ Njeuma, Martin Z. (2012). Fulani Hegemony in Yola (Old Adamawa) 1809-1902. Cameroon: Langa. ^ Last, Murray (1967). The Sokoto Caliphate. New York: Humanities Press. pp. 74–75. ^ Hiskett, M. The Sword of Truth; the Life and times of the Shehu Usuman Dan Fodio. New York: Oxford UP, 1973. Print. ^ Baten, Jörg (2016). A History of the Global Economy. From 1500 to the Present. Cambridge University Press. p. 323. ISBN 9781107507180. ^ Claire Hirshfield (1979). The diplomacy of partition: Britain, France, and the creation of Nigeria, 1890-1898. Springer. p. 37ff. ISBN 90-247-2099-0. Retrieved 10 October 2010. ^ The Cambridge History of Africa: 1870-1905. London: Cambridge University Press. 1985. p. 276. ^ a b Falola, Toyin (2009). Colonialism and Violence in Nigeria. Bloomington, IN: Indiana University Press. ^ Comolli (2015), p. 103.